Short-wave Ultra Violet light is very damaging to the skin and eyes. Ozone generation is another hazard. This can be produced by the action of short-wave UV on oxygen in the air. 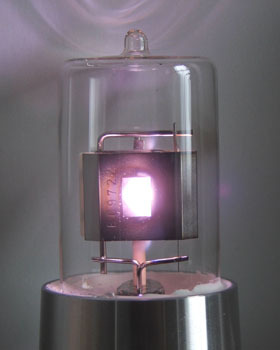 The Deuterium lamp shown on the right operating, emits a blue-white light. However, these lamps are used to produce Ultra-Violet (UV) emissions which we can't see. The outer lamp envelope is made form quartz rather than glass. This is because glass does not transmit short wave UV light. What makes Deuterium lamps so special, as a UV source, is its continuous spectrum in the range from 180nm - 300 nm. Unlike most types of discharge lamp these run on DC and have a pre-heated cathode. This takes the form of a filament which is initially heated by a low voltage source. The picture below shows the heater running. With the heater on, and the lamp voltage applied, the lamp will not start. A third supply is required to strike the arc and establish ionisation. The top of the lamp is shown above right with the arc struck. The heater supply can be reduced or removed at this point as heating is maintained by ion bombardment, providing the arc current is high enough. The start or strike voltage is around 400V while the running voltage is under 100V. The lamp shown here has a designed arc current of 300mA. 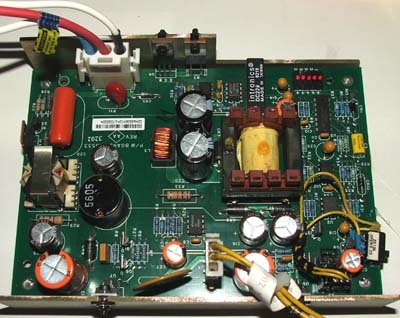 A commercial electronic driver for this type of lamp is shown below on the left. The small block of red LEDs on the top right of the circuit board indicates the start sequence for the lamp. From right to left LED: 1- Power available. 2- Lamp supply up. 3- Heater timer 4-Ignition and run-up. 5-Lamp at full output and heater supply reduced. Below on the right is the visible spectrum, for this lamp, obtained using a diffraction grating. This type of lamp is mainly used as a UV source which is beyond the blue end and invisible to they eye and therefore can't be shown here.